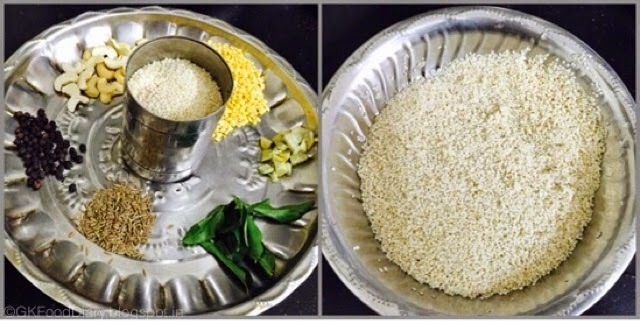 Millet’s provides so many health benefits to us compared to regular rice. Hence we can replace rice with Millet’s wherever possible. There will not be much different in taste though. 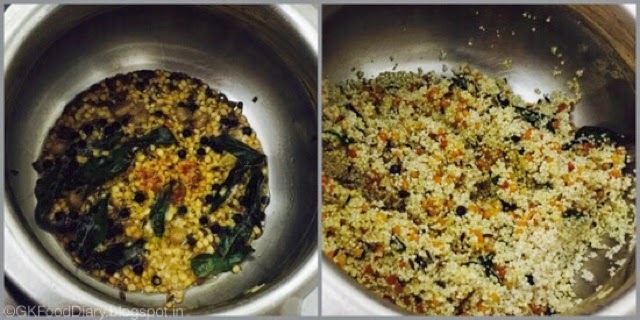 It’s my first recipe with millet and hoping to try more in future. 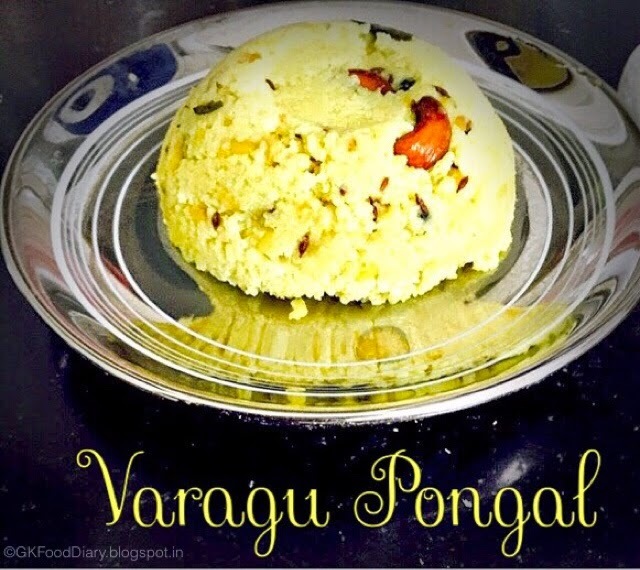 I have used Varagu (Kodo millet) to make this Pongal. The recipe is very simple and you can opt this for a easy breakfast. 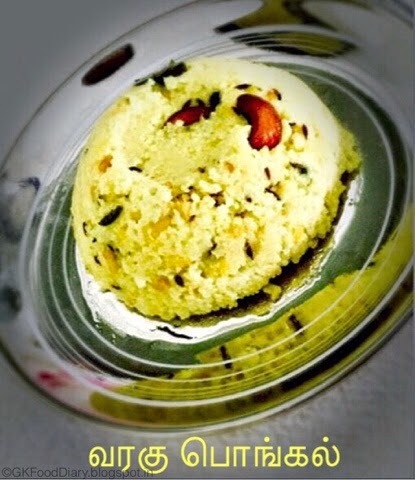 We simply loved this Pongal than our regular Kara Pongal. Take all your ingredients and chop the ginger finely. Wash the Varagu rice twice and keep it ready. 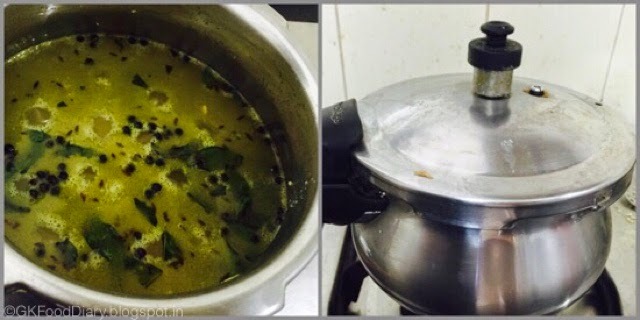 Heat a small pressure cooker with ghee and add pepper, jeera. Once the pepper starts splutters, add curry leaves. Then add moong dal with ginger and saute for two minutes. Add turmeric powder at this stage and mix well.After that add the washed Kodo millet in and fry it for a minute. Add water and bring it to a boil.Now close the lid of the cooker and pressure cook it for four whistles in medium flame. 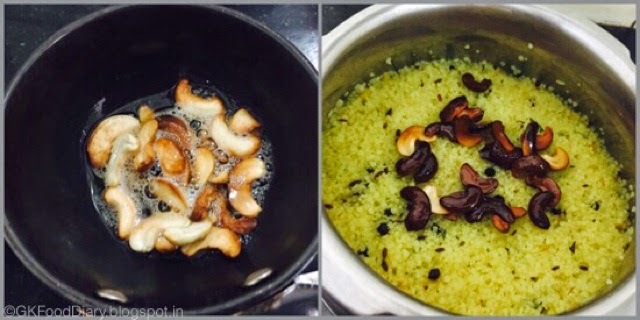 In the meantime, Heat a tadka pan with ghee.Once the ghee is heated, add cashews and fry it till golden brown.Add the ghee fried cashews to the Pongal once pressure released from the cooker and mix well. Transfer to a serving plate! 1. Heat a small pressure cooker with ghee and add pepper, jeera. Once the pepper starts splutters, add curry leaves. 2. Add turmeric powder at this stage and mix well.After that add the washed Kodo millet in and fry it for a minute. 3. Add water and bring it to a boil.Now close the lid of the cooker and pressure cook it for four whistles in medium flame. 4. In the meantime, Heat a tadka pan with ghee.Once the ghee is heated, add cashews and fry it till golden brown.Add the ghee fried cashews to the Pongal once pressure released from the cooker and mix well. Transfer to a serving plate! 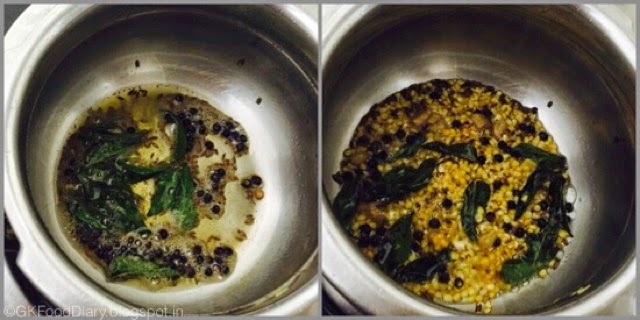 Serve hot with coconut chutney or sambar! Delicious and healthy breakfast is ready. 1. Add generous amount of ghee to make it more tasty if you are not a weight watcher! 2. 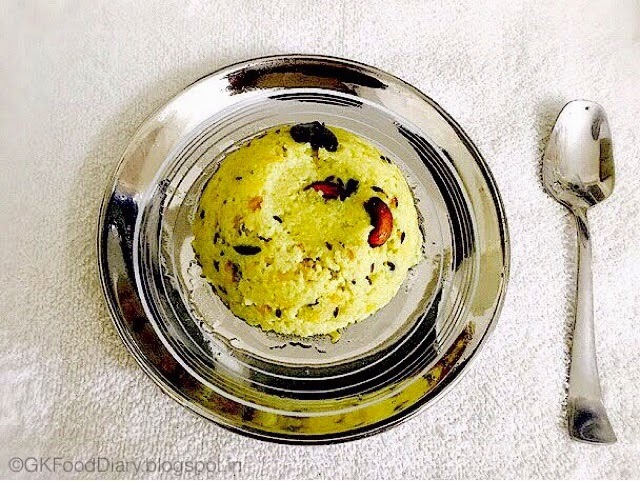 You can use any millet instead of Varagu rice and try your hands on this recipe! Can I give this Millet to my 14 month old? Does it produce heat during summers? U can give it once a week. That should be okay. can give this to my 9 month old baby. does it create any problem. can I give this to 9 month old baby.Does it create any problem. what all problem it I’ll create. what are all problem does it create while feeding by 9 month baby. As per many pediatricians, first all family staple foods should be given to babies to ensure easier digestion and to check baby’s tolerance level. If your baby is doing well with other foods and millets are your family’s staple, then you can go ahead with millets now.